To read about the mystery of this 1941 internment camp drawing, see bottom of post. Is this man typing on the Astoria portable typewriter above, now owned by me? I have to stop doubting the word of my typewriter donors. 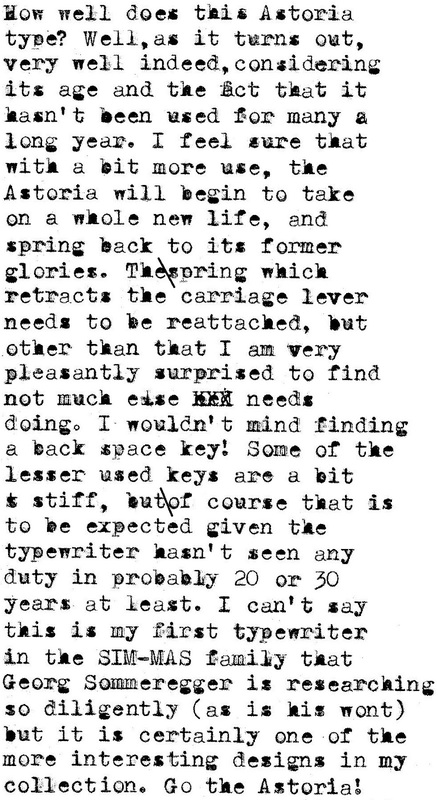 In late April, I was contacted by Tom Roberts, who told me he had a Tradition typewriter for me. Driving to Tom’s house, I kept wondering what typewriter brand name Tom could possibly have mistaken for “Tradition”. When Tom opened the typewriter case, I saw that what he was giving me was a Tradition. 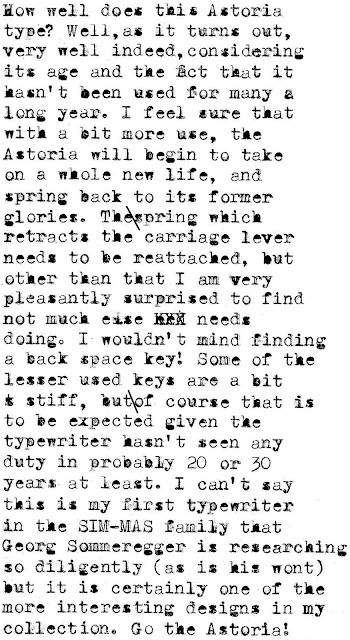 Two weeks ago, another Canberra gentleman, Geoff Winter, got in touch saying he had an Astoria typewriter for me. 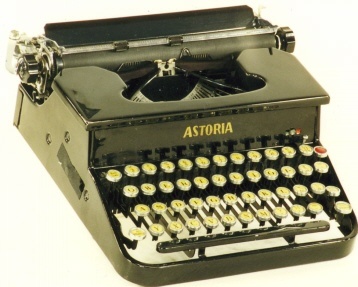 Naturally, I immediately keyed in a Google search: “Astoria+typewriter” - and an awful lot of results for a typewriter repair shop in Astoria, New York, came up. But no Astoria typewriter. Yet again, I at first suspected a potential donor had made some mistake, and misread the brand name. Eventually I found the “Europa-Oliver-SIM-MAS family” page under the “Italy” section of Will Davis’s European Typewriter Project, put together primarily with images of typewriters from the late Tilman Elster’s collection. Astoria portable typewriter from the late Tilman Elster's collection, featured on the European Typewriter Project web pages. When I saw the Astoria there, my heart began to race. Gee, I thought, if Geoff’s Astoria is anything like this one from Tilman's collection, I am indeed in luck. This was a quite different portable typewriter design to anything I’d ever seen before, even decidedly different from other typewriters which came under the SIM-MAS heading. Well, it turns out to be even better than that. Today I took ownership of the Astoria typewriter and soon discovered its inherent wonders. Whereas on the late Tilman’s Astoria the brand name appears to be a decal, on mine it is embossed metal in silver, very much like the early Olivetti portables (ICO MP1, Studio 42). Tilman’s Astoria has the serial number 1144101, but mine is A5676, indicating a much earlier version. After excitedly rushing home with Geoff’s gift, and cleaning up the slightly battered and clearly aged Astoria (lots of dark lint in murky corners again), I was additionally delighted to find it works beautifully. I’d had my concerns on the way home, not having tested the Astoria in Geoff’s presence at the Canberra Museum and Gallery (“Never look a gift horse in the mouth”, as they say!). The carriage appeared to be off the escapement rack and a cursory tap of the spacebar produced no movement. But once home, I found there was absolutely nothing wrong with the Astoria (apart from a small retraction spring missing from the carriage lever). Good ol’ Georg, he can always be relied upon to come up with the necessary, vital information. The result of his research work into European typewriter history is extraordinarily detailed. And so it proved with the SIM machines, including a nice ad for a Patria from the Società Industriale Meccanica (SIM) in Turin. 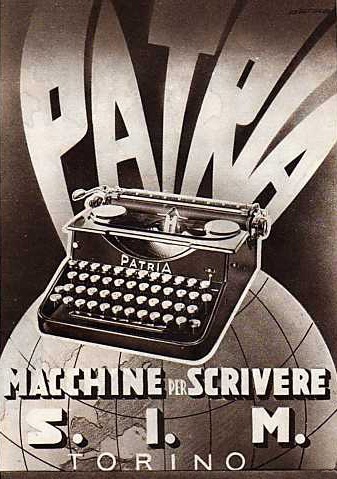 The Patria in the ad is exactly the same as my Astoria. The ad is below and Georg’s SIM page (which includes the image of Tilman’s Astoria) is here. Georg has appealed for any information anyone can give him on Oliver-SIM-MAS-Novalevi family typewriters, and I would urge anyone who can help him with this most worthy project to please do so. I have been meaning myself to post on my wide collection of Oliver portables, and am now more motivated to get to them. But in the meantime, back to the Astoria. 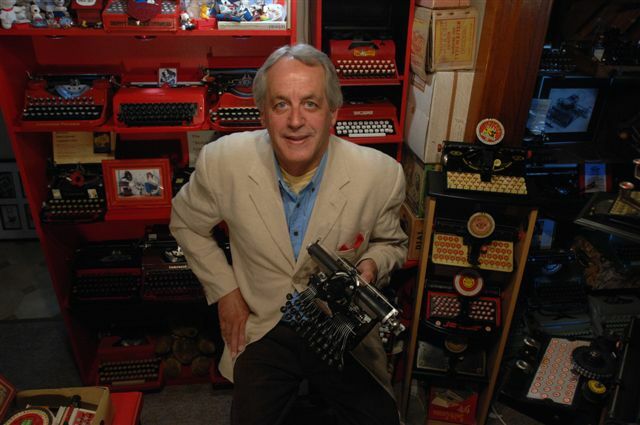 Will Davis says, “In various research projects, it has been found that two families of portable typewriters existed in Europe; one before the Second World War, and one following. In each case, these families began with a root machine, and this design was either then marketed widely in Europe, or else manufactured widely in Europe.” Georg says Germany, England (Croydon in South London) and Italy (Turin) are the three countries in which machines in this line were mostly made. Will lists a number of brand names, including Novalevi, Montana, Guidonia, SIM, Simtype, Oliver, MAS (I still haven’t managed to work out what MAS stands for) and Augusta Monaco. Georg adds Ardita, Balilla, Iris, Littoria and Patria to the list of family members. “Much more work needs to be done along this line,” Will concludes. I hope my Astoria can now add to Will’s and Georg’s researches. Now, as I’ve said in the past few days, I’ve had of late enormous good fortune with what Peter Baker referred to as “back stories” to my typewriter acquisitions – notable among them the green Olympia portable which was given to me by Christel Stahl. The back story behind the Astoria must rank up there with the very best. Geoff’s father escaped Austria alone, leaving his family behind him. His family perished under Nazi occupation. 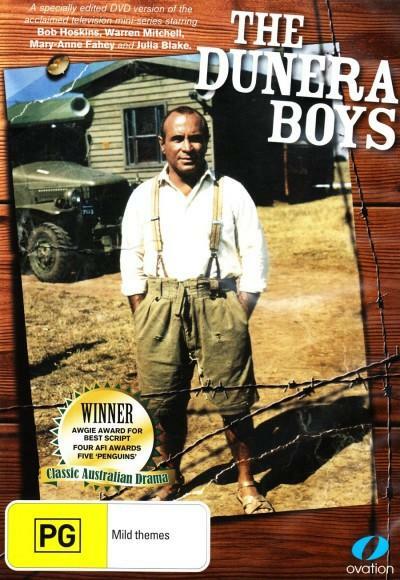 Geoff’s father became one of the famous “Dunera Boys”. 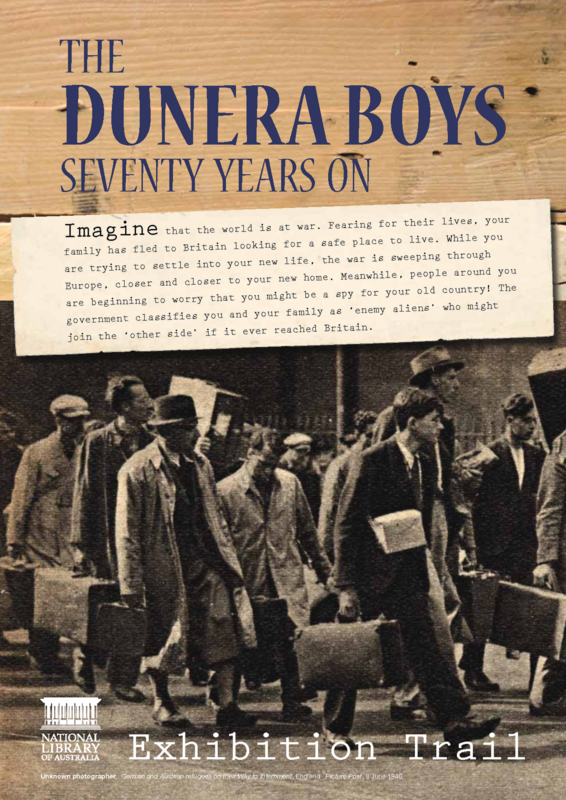 These men came to Australia from war-torn Europe in a Glasgow-built troop transport turned passenger ship called the Dunera. It is regarded as “one of the more notorious events of British maritime history”. After the fall of France, men of German and Austrian origin in Britain were rounded up as a precaution. The intention had been to segregate those who might pose a risk to security from those who were neutral or who had fled to Britain to escape from Nazism. But in a wave of xenophobia, such distinctions became lost. In what Winston Churchill later regretted as “a deplorable and regrettable mistake”, they were all suspected of being German agents, potentially helping to plan the invasion of Britain, and a decision was made to deport them. 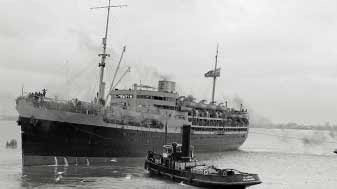 On July 10, 1940, 2542 detainees, all classified as “enemy aliens”, were embarked on to the Dunera at Liverpool. They included 200 Italian and 251 German prisoners of war, as well as several dozen Nazi sympathisers, along with 2036 anti-Nazis, most of them Jewish refugees. 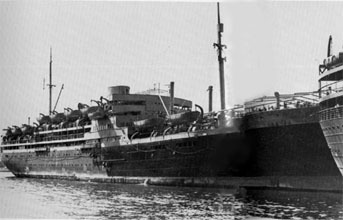 Some had already been to sea but their ship, the Arandora Star, had been torpedoed with great loss of life. In addition to the passengers were 309 poorly trained British guards, mostly from the Pioneer Corps, as well as seven officers and the ship’s crew, creating a total complement of almost twice the Dunera’s capacity as a troop carrier of 1600. The internees’ possessions were rifled and subsequently the British government paid ₤35,000 to the Dunera victims in compensation. [Happily, Geoff’s father’s Astoria typewriter survived this outrageous crime]. Moreover, the 57-day voyage was made under the risk of enemy attack. But it was the physical conditions and ill-treatment that were most deplorable. The ship was an overcrowded Hell-hole. Hammocks almost touched, many men had to sleep on the floor or on tables. There was only one piece of soap for 20 men, and one towel for 10 men, water was rationed, and luggage was stowed away so there was no change of clothing. As a consequence, skin diseases were common. There was a hospital on board but no operating theatre. Toilet facilities were far from adequate, even with makeshift latrines erected on the deck, and sewage flooded the decks. Dysentery ran through the ship. Blows with rifle butts and beatings from the soldiers were daily occurrences. One refugee tried to go to the latrines on deck during the night – which was out-of-bounds. He was bayoneted in the stomach by one of the guards and spent the rest of the voyage in the hospital. 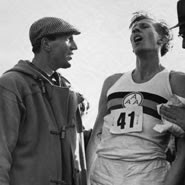 Stampl with Bannister at Oxford University immediately after Bannister had broken the four-minute mile barrier in 1954. Among the transportees on the Dunera were Franz Stampfl, later the athletics coach to the four-minute-mile runner Roger Bannister, Wolf Klaphake, the inventor of synthetic camphor, the tenor Erich Liffmann, artists Heinz Henghes, Ludwig Hirschfeld Mack and Erwin Fabian, art historians Franz Phillipp and Ernst Kitzinger, and the photographers Henry Talbot and Hans Axel. Also on board were theoretical physicist Hans Buchdahl and his engineer (later philosopher) brother Gerd; and Walter Freud, grandson of Sigmund Freud. On arrival in Sydney on September 6, 1940, the first Australian on board was medical army officer Alan Frost. He was appalled and his subsequent report led to a court martial. Lieutenant-Colonel William Scott, the senior officer, was “severely reprimanded”, as was Sergeant Helliwell. 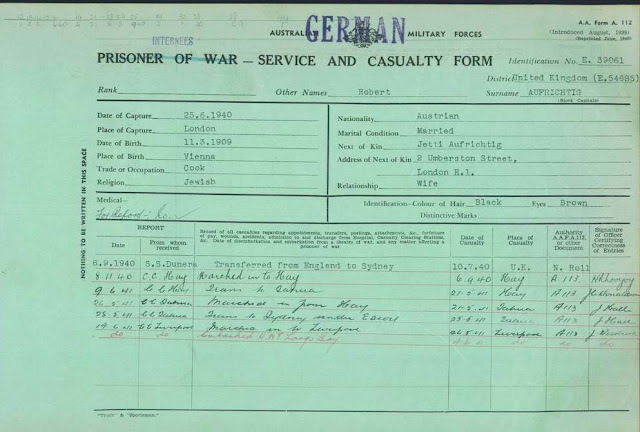 RSM Bowles was reduced to the ranks and given a 12-months prison sentence and then discharged from the Army. After leaving the Dunera, the pale and emaciated refugees were transported through the night by train 750km west out of Sydney to the rural town of Hay in the centre of New South Wales. 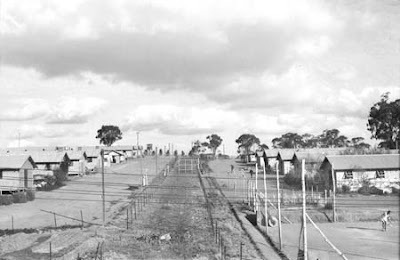 The treatment on the train was in stark contrast to the horrors of the Dunera – the men were given packages of food and fruit, and Australian soldiers offered them cigarettes. There was even one story of a soldier asking one of the internees to hold his rifle while he lit his cigarette. depicts the theft and jettisoning of internees' property. Somehow the Astoria typewriter managed to survive these criminal acts. 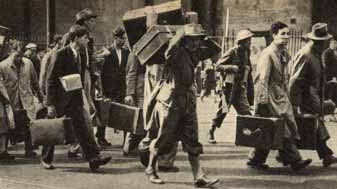 Almost all the rest made their way back to Britain, many of them joining the armed forces there. Others were recruited as interpreters or into the intelligence services. "This plaque marks the 50th anniversary of the arrival from England of 1984 refugees from Nazi oppression, mistakenly shipped out on HMT Dunera and interned in Camps 7 & 8 on this site from 7.9.1940 to 20.5.1941. Many joined the AMF on their release from internment and made Australia their homeland and greatly contributed to its development. Donated by the Shire of Hay – September 1990." See here for podcasts about the Dunera Boys story as well as here. This pencil and crayon caricature, titled “Rosenbaum typing”, was drawn at the Dunera Boys’ internment camp at Tatura in Victoria by Fred Lowen in 1941. Has Rosenbaum borrowed the Astoria typewriter, I wonder? How many portable typewriters would there have been in an internment camp in rural Australia in 1941? How many typewriters survived the voyage on the Dunera from England? Oh, this is truly amazing Robert. Brilliant! Absolutely amazingly brilliant! You've excelled yourself with this post. Such a sad and poignant story! Those men (and that machine, it seems) truly went through hell. 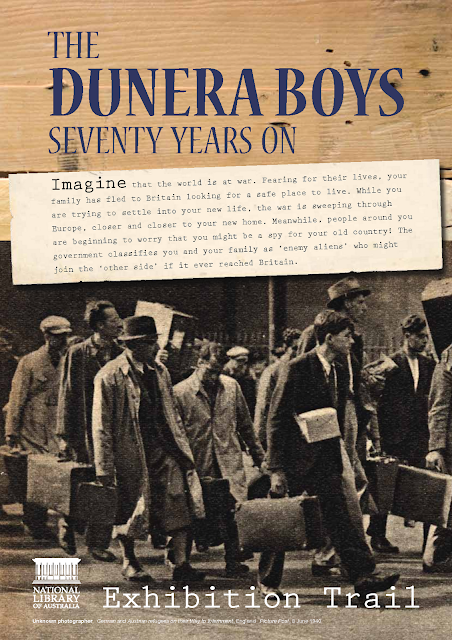 Thank you for sharing that with the world; I had never heard of the Dunera Boys! Thank you for keeping this incredible history alive. Very interesting indeed! The shocking Dunera story is news to me too, and the typewriter is a beautiful and historic artifact. Wow! Another great story! He sure accomplished a lot after that trip. Very interesting typewriter as well. 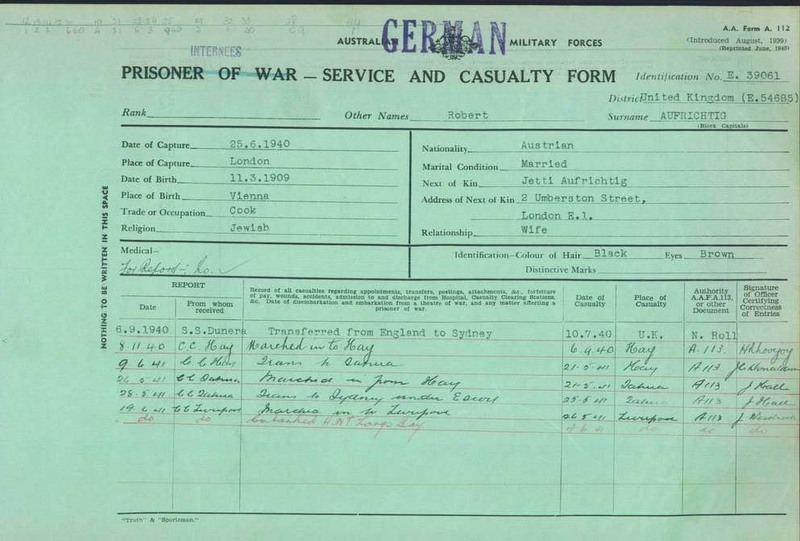 You may be interested in the extract from the report dated 12.9.1940 by the Australian officer, Captian A R Heighway, in charge of the disembarkation of the Dunera Internees in Australia. I would suggest in future shipments, the staff should be increased to 1 Officer, 4 Sgts., and 4 male typists, portable typewriters to be taken on board, the orderly room staff on baord had no typewriters for their use, those used, being the property of the internees." Great typer, and great story to go along with it. I wish more people around here would give me rare old typewriters! You, sir, are a magnetic. I must, at some point, come into contact with you, in an attempt that some of that will rub off on me! Thanks for sharing this awesome history with us. How neat would that be if that was your Astoria in that drawing? Hi. If Alan (Son of a Dunera Boy) sees this, could he please contact me at my email address. The donor of the typewriter would very much like to make contact with you.